I still cannot understand why Putin is trying to provoke, and alienate, the West. What's in it for him? Internal politics? We mean them no harm. Quit washing your clothes. It's bad for Gaia. For the children. Internet censorship proposed. h/t, Insty. What are "Men of Goodwill"? Anchoress.�It is my goal to be one of those men. Things I've learned since 9/11.� Right Thinking from the Left Coast. It's impossible to agree with Lee on everything, but he can be counted on to say what he thinks. Is $100 dollar oil on its way? I wouldn't be surprised. Prof. Deneen. Economic consequences? You bet. The Lancet was once the most respected medical journal in the world. Since it went political, it isn't any more. Rick Moran. It survives only on its old reputation. How about a lesson on the best way to boil (steam?) lobster? Silicon Valley needs to get cracking on some sort of teleportation unit that can deliver a nice lobster dinner like that by just right-clicking on the image. We had the best Dungeness crab last Sunday. The best. The rule is to steam, not boil. If you boil, you lose 30% of the flavor. To be merciful, get up a good head of steam first. Always remember, the bigger the lobster, the better. We like the 6-7 pounders, and let the fish market steam them for you. Yes, the food looks yummy indeed. I'm sure Vlad Putin would also think so. Why you ask .. perhaps a few quotes and anecdotal info will suffice the answer. "You are in the courtroom of world opinion�. All right, sir, let me ask you one simple question: Do you, Ambassador Zorin, deny that the U.S.S.R. has placed and is placing medium- and intermediate-range missiles and sites in Cuba? Yes or no � don�t wait for the translation � yes or no?" [The Soviet representative refuses to answer.] "You can answer yes or no. You have denied they exist. I want to know if I understood you correctly. *I am prepared to wait for my answer until hell freezes over, if that�s your decision*. And I am also prepared to present the evidence in this room." US UN Ambassador ,Adlai Stevenson II during the 1962 Cuban Missile Crisis. Stevenson also once characterized the Soviet Union as a thief in a hotel who simple walks down the hallways , testing each doorknob , until he finds an open room...that is Russia...Russia under Putin is just the KGB Soviet Union without the Hammer and Sickle flag. They see the US currently embrioled in an internicine fight between the Democratic Socialists and the President over the war in Iraq and they are making hay while the sumn shines. The Russians claimed on July 12th a great scientific discovery late last month. An expedition of 50 scientists that spent 45 days aboard the Rossia nuclear ice-breaker found that an underwater ridge (the Lomonosov ridge) directly links Russia's Arctic coast to the North Pole. This, they insist, *surely guarantees Russia's rights over a vast Polar territory that also happens to contain some 10 billion tons of oil and natural gas deposits*. So here we go. We're occupied and their claiming vast new territories which no doubt they will soon ocupy with a phalanx of picket ship and shore stations. They ALWAYS push,push,push .... to say the US has a few international difficulties is a bit like saying the Elephant Man had a small skin disorder. how deep should the water be at the bottom ? 6-7 pounds? Are you kidding? Haven't seen one of those in a long, long time. Just out of curiousity,how much per pound are you folks paying? Well, I was going to say nice job with the links, but I'll also say the food looks good! Only if we look at inflation (which I'll grant that the linked article does). But in terms of constant dollars, probably no. The primary reason is that a significant number of other energy sources become economically viable when compared to oil at that (constant inflation-adjusted-dollar) price. The "break-even" point for a variety of things, including tar sands, coal-to-liquids, even solar PV occurs right around that range of price. In addition, the law of supply-and-demand kicks in, and vast petroleum reserves suddenly appear. And you can say, "appear", because we already know the oil is there...but in oil-patch lingo, it's not a "reserve" until it's economically recoverable. Take a look at how the oil industry differentiates between words like "proven reserves", "reserves", "resource", or "total resource" as an example. The Saudis control the world supply of oil, simply because of the fact that they have the worlds lowest production costs and a huge supply. They have a vested interest in keeping the world price of oil just barely below the level at which other energy sources hit their break-even point. 1. Lobsters. Doesnt matter how deep the water is as long as you have a good head of steam for 15-20 minutes, depending on the size. Use salt water. 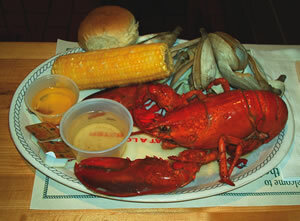 I use a lobster/clam steamer pot for 1-2 lb lobsters, but I prefer the big boys. 2.Price of oil - I supopose the Saudis control the price, but only to a point. There is a lot of demand, and it takes alternatives years to be useful. 3. Putin - H is probably right. It's just the way they are - Imperialists. That was, absolutely, the worst piece of economic writing I've ever read. The "facts" were "Wrong," and the analysis was nonsensical. Silliness, Rampant. Hope you're do'in fine..miss chatt'n with ya. tater says Hi! Re: Lee and Right Thinking from the Left Coast. Lee needs to keep thinking through what he thinks he learned. His ostensible starting points for his "new learning" are, to be charitible, tenuous. During high oil pricing, OPEC has traditionally filled their coffers whilst their competitors commit to very big exploration and development expenditures. THEN they crash the price. These crashes have been induced by Saudi Arabia and other OPEC cheats. The crash very quickly kills efforts to find and produce more oil or to fund alternatives and it often succeeds in putting OPECs competitors right out of business too, but the global demand for oil now may have risen so much that maybe OPEC can no longer control pricing. Historically, cartels have always broken. I doubt that economic cycles will end just because of growth in China and India. An economic slowing is inevitable, but so far, betting against the US economy has never been a smart long term bet. With high interest rates putting a strain on some budgets, cash could become king again and there may be some very good deals to be found by people who have some. Also with the low dollar there will be a tourist boom and probably a fairly steady demand for US goods including stocks and real estate. Many foreigners holding US funds will buy US stocks and real estate just like the Japanese did in the 80's and they can't take USA real estate home. It stays and the taxes and maintenance costs stay too. I tend to look to employment figures to signal a real recession. When the jobs go, so does the ability of folks to pay the mortgage. As long as people are employed lenders will work with them to try to keep them from defaulting. It is when there is no work that things fall apart rather quickly. Yep, it's all going to be very interesting when we can spare the time to address the challenge. First of course we need to have, as Harry Reid promised, another 100 investigations into this administration while at the same time abandoning Iraq to the clutches of AQ and Iran, thus setting off a nuclear attack by Israel on Iran. I'd really like to know what it's going to take to wake up this country to the fact that we are in very deep water and the sharks are tightening their circles...I mean how long can we remain stupid? Are we going to remain stupid for so long that the only thing that will retrieve our security is a nuclear exchange? Also, being a man of goodwill is a terrific goal NJ. I think you will very likely find a nice girlfriend one day soon. I know women do like guys who cook. Gads, Habu, thanks for the vote of confidence, but I skimmed through that article, and I'm just too pooped to fisk that many inaccuracies in that many paragraphs. Tell Tater, Hi, and that I will try to give it a go after my nap, though.